A thriller of a war that never was – of survival in an impossible city – of surreal cataclysm. 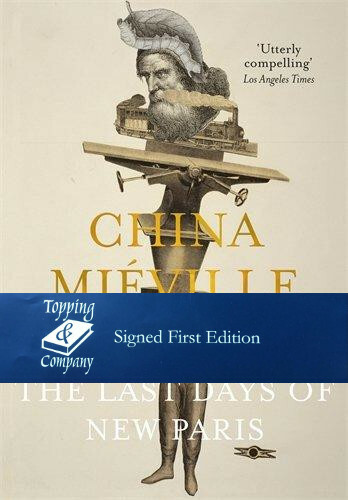 In The Last Days of New Paris, China Mieville entwines true historical events and people with his daring, uniquely imaginative brand of fiction, re-configuring history and art into something new.1941. In the chaos of wartime Marseille, American engineer and occult disciple Jack Parsons stumbles onto a clandestine anti-Nazi group, including Surrealist theorist Andre Breton. In the strange games of dissident diplomats, exiled revolutionaries, and avant-garde artists, Parsons finds and channels hope. But what he unwittingly unleashes is the power of dreams and nightmares, changing the war and the world for ever.1950. A lone Surrealist fighter, Thibaut, walks a new, hallucinogenic Paris, where Nazis and the Resistance are trapped in unending conflict, and the streets are stalked by living images and texts – and by the forces of Hell. To escape the city, Thibaut must join forces with Sam, an American photographer intent on recording the ruins, and make common cause with a powerful, enigmatic figure of chance and rebellion: the exquisite corpse.But Sam is being hunted. And new secrets will emerge that will test all their loyalties – to each other, to Paris old and new, and to reality itself.